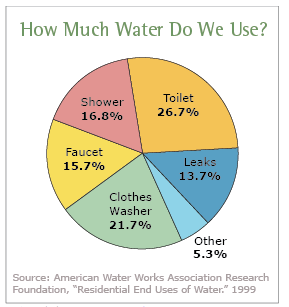 Around here we talk a lot about high-efficiency toilets and water use so Fix a Leak Week is naturally on our radar. But I wonder, how many people actually know about it? Let’s be honest, theme weeks can be lame attempts at spreading awareness about random things only a small percentage of people care about. However, this one really does warrant your attention. Water matters—whether you think about the earth or your budget. It’s a good time to make sure you’re not unwittingly draining either one. Why not go one step further? Definitely check for leaks and make repairs, AND choose one way to proactively green up your space. Depending on your budget, you could swap an old water-guzzling toilet for a new high-efficiency toilet that uses just 1.28 gallons per flush. This is one of the easiest and most effective water saving things you can do in the bathroom. Yes, it’s the place we Americans consume the most water in the house. If your budget doesn’t allow for a new toilet, consider a low-flow showerhead and replacing the aerators on your faucets. Just a quick Google search will give you loads of ideas for saving water around your home.